It’s been a couple of years since we had last shot the Forest of Ardens ground so it was good to get back there and see how it has changed. Day started with rain showers which thankfully stopped by 11 with the weather brightening up, so by end of day we had brilliant sunshine. 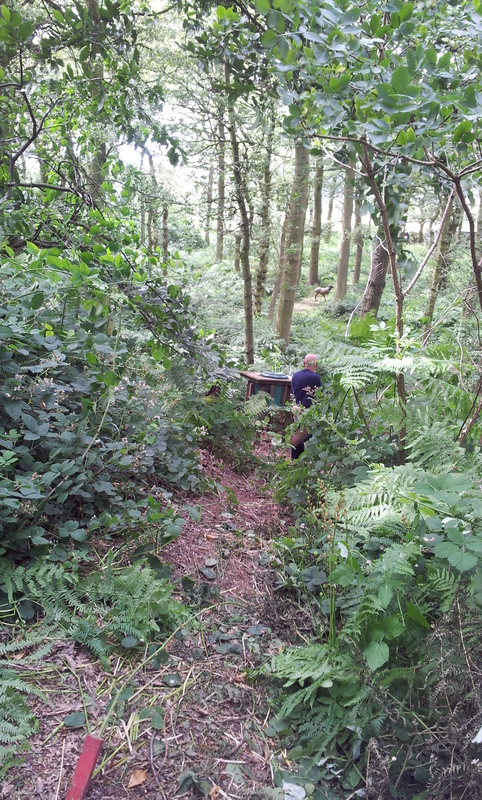 Situated not far from Coventry, Forest’s ground comprises of a mature broad leaf woodland. 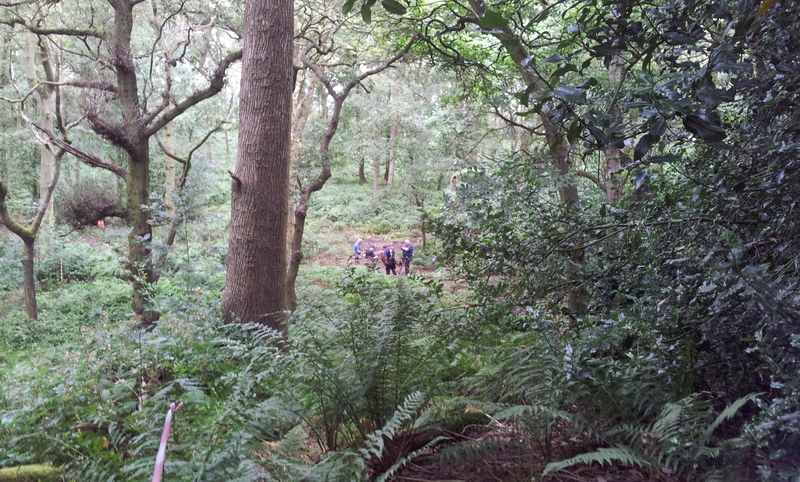 Carpeted in bracken and brambles it makes for some lovely set targets and views across the countryside. Though the ground is fairly flat there are a few hollows which they make good use of. There was one stage you were going up and down the slopes lots and the club must have been busy as they had cut steps in to make it easier. Thanks guys, I know how much hard work this takes. If you are thinking of visiting them be warned that the car park is a fair walk from the wood so make sure you remember everything when you leave the car. Another tip would be to take it easy driving down the narrow lane to the site as the hedges are very high so you can’t see much. The course itself comprised 40 Mixed targets of 3Ds of varying size and conditions with a couple of the smaller ones showing their age. I think some of the 3ds could have done with some back stops as arrows disappeared into the bracken or undergrowth if you missed. 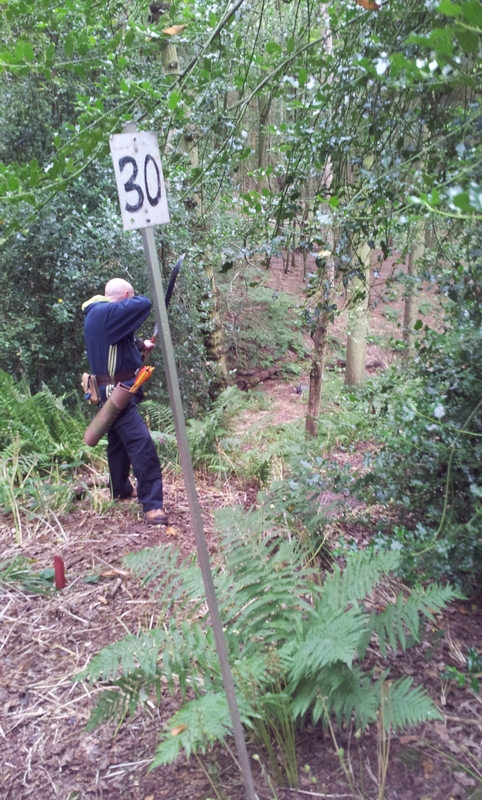 This kept many marshals busy searching for arrows and they admitted they ran out of time on Saturday when preparing the course. It would be a shoot through with two opportunities to take on food and water, between targets 40-1 & 21-22. 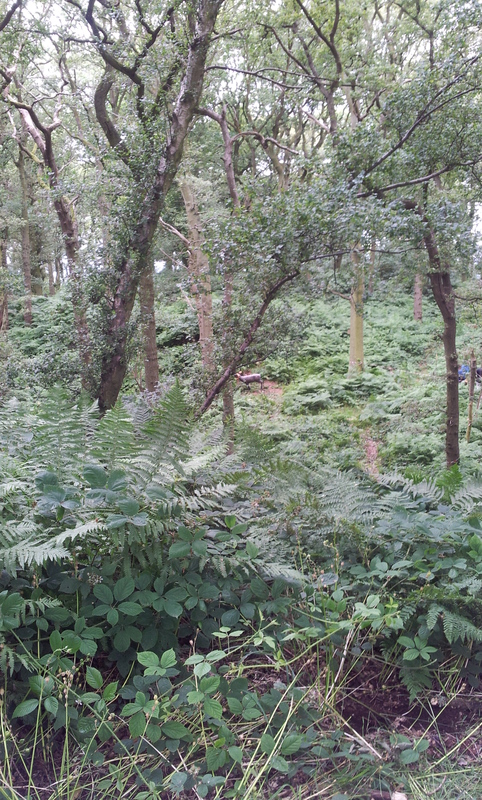 Unlike other grounds this is two separate locations either end of the woodland. 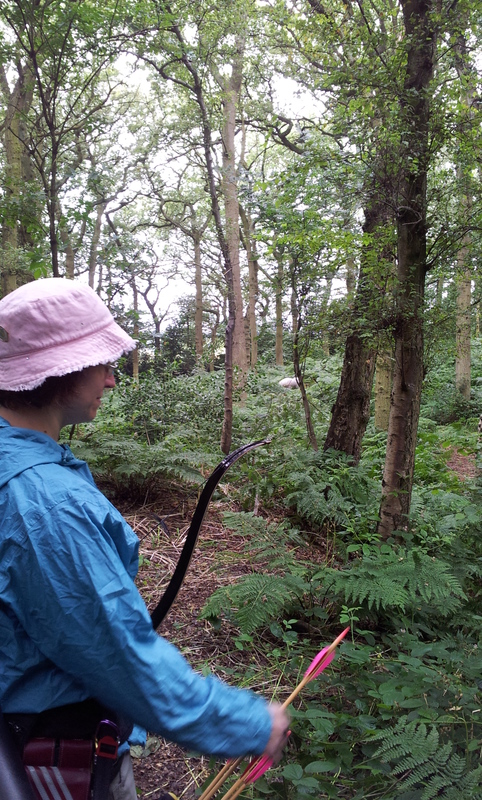 The shoot was well attended with most groups numbering 4 archers. 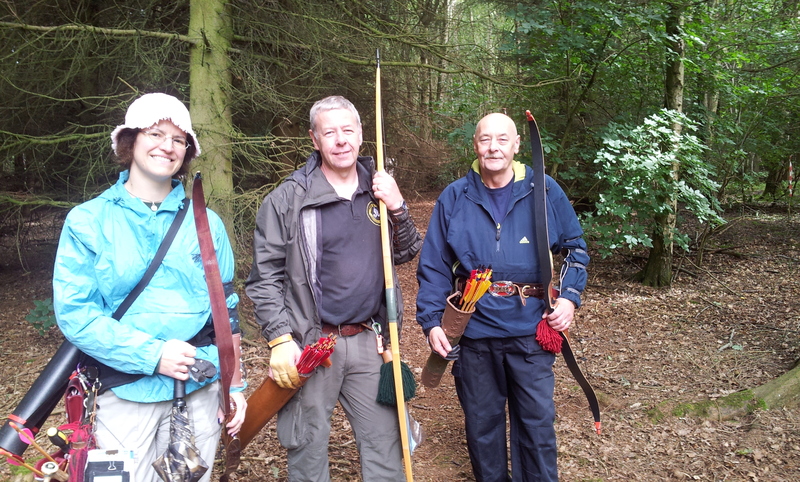 In ours we had Peter and Paul from Paget shooting longbow and hunting tackle join Sharon and myself. 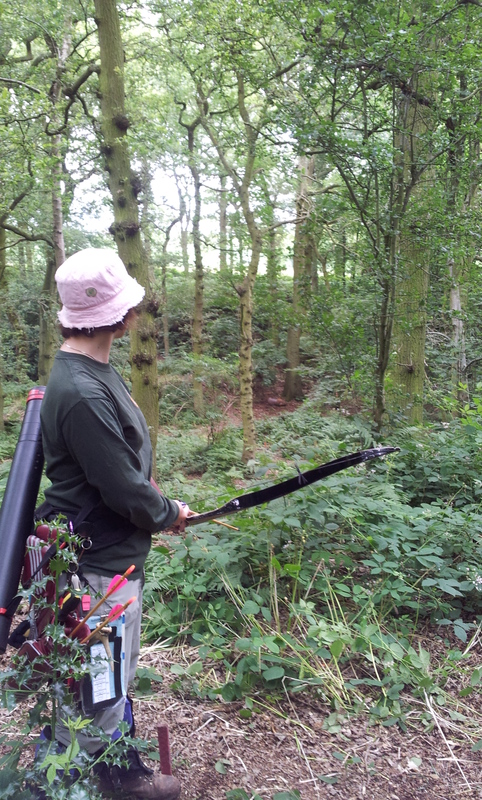 The day flowed well with few hold ups mainly from searching for arrows that had missed the target and disappeared into the bracken jungle. We’d finished by 4 pm and joined the other assembling archers for the raffle and prize giving. Don’t think there were any stretched targets though some were approaching what might be considered maximum range. Sharon shooting bedded deer in the afternoon. Only negative comment I’d say was that there were a few targets where you felt the next target shooting pegs were a bit close making you feel a bit uncomfortable when at the peg. There was a slight delay at the end waiting for the last groups to come in caused due to some confusion over what targets could or should be brought in. This resulted in a couple of targets having to be taken back out so the last groups could finish shooting. Easily done and didn’t affect the overall feel of the day which was very positive. Shot across a pond at a crocodile. There were lots of SVYF there and if there had been a team trophy I think we might have won it. 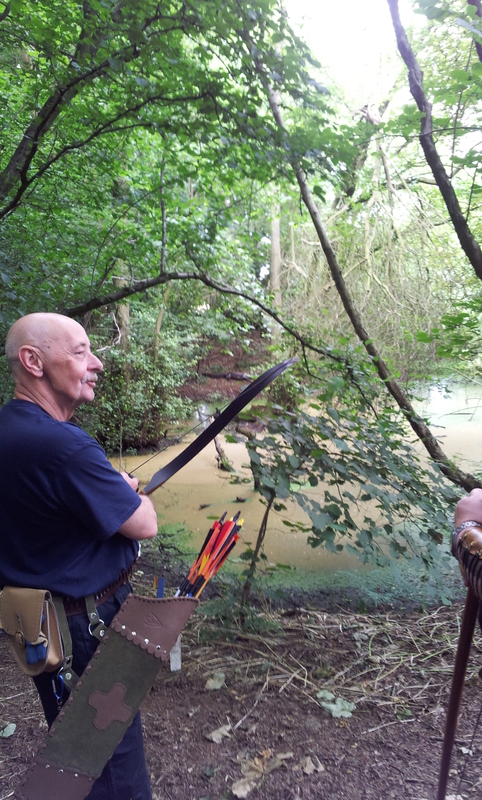 Well done to Chris and Keith Harley on both placing in longbow. Sharon won ladies hunting tackle. With Jason, Steve, Gail and Martin also placing. Sorry if I’ve missed anyone out. Sadly nothing for me but to be truthful I’m not surprised. This was my first outing using a shooting glove rather than tab. I’d only shot a few arrows the day before to see how it felt. I was pleasantly surprised by scoring okay and not blanking any. Definitely need practice though as glove is very different to a tab.